Philadelphia, PA -- Stephen Curry had 20 points, six assists, five rebounds and three steals in the Golden State Warriors' 89-84 win over the Philadelphia 76ers on Monday. Leandro Barbosa added 16 points and six boards for the Warriors, who were held under 100 points for the first time since a 100-86 loss at the Clippers on Dec. 25. 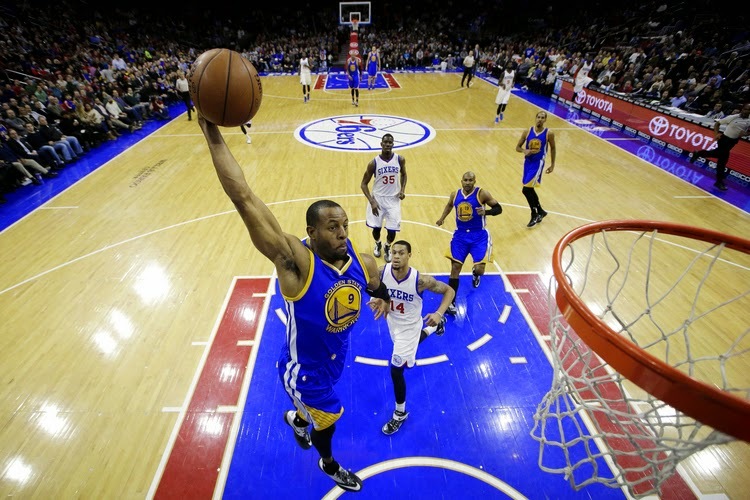 Former Sixers Andre Iguodala and Marreese Speights tallied 13 and 10 points, respectively, for Golden State, which has won five of six. The usually hot-shooting Klay Thompson was limited to 13 points. a 59-23 mark (36 games). Robert Covington ended with 21 points, eight rebounds and three steals for the Sixers, who had a four-game home winning streak snapped. Luc Richard Mbah a Moute contributed 13 points and nine boards. "I'm so proud of our guy's defensive improvement, their attention to defense, they take pride in it and know that it is our identity," said Sixers coach Brett Brown. Trailing 28-20 early in the second quarter, the Warriors scored eight straight points to tie things up. They led 46-44 at the half. Golden State started the third stanza on a 9-2 spurt to make it 55-46. However, the pesky Sixers hung around and got within four late in the frame. But Draymond Green's jumper gave the Warriors a 67-61 lead heading to the fourth. The visitors created some distance with a 14-2 run to start the final quarter. Barbosa and Speights each tallied six points during the surge to make it an 81-63 contest. Philadelphia answered with 12 straight points to get within 81-75. They got as close as four in the final minutes, but ran out of time. "We did enough to get the win and that's the most important part," said Warriors coach Steve Kerr. Notes: Golden State had scored 100 or more points in 21 consecutive games ... Nerlens Noel had 11 points and Tim Frazier and JaKarr Sampson each scored 10 points for the Sixers ... The 76ers turned the ball over 27 times, leading to 35 Golden State points ... Philadelphia guard Michael Carter-Williams (toe) missed his third straight game ... Green left the game late in the fourth quarter with a sprained right ankle.